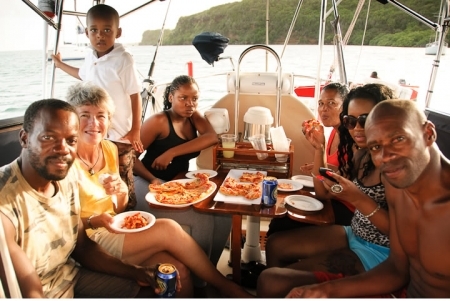 Before we left Grenada, we had a pizza party onboard Receta with Dwight and Glenis, and “Mr. Trouble,” their young son, Akel. Who, it turned out, didn’t live up to his reputation at all. He was incredibly well behaved, the perfect boat guest. (He entertained himself climbing up and down our companionway steps and zooming a little toy car around the cockpit table.) Dwight’s fishing partner Stevie was also there, of course, and Glenis’ daughter, Alisha, and her cousin. The main event was lambi – conch – pizza, although I also made a couple of pepperoni pies for variety. Usually, our lambi comes from Dwight and Stevie. But this time I had lambi in the freezer…. A week or so earlier and several islands to the north, in Bequia, I had also decided to make lambi pizza for an onboard gathering. But finding the lambi turned out to be an adventure. There was none in the fish market in Admiralty Bay. (No fish either. In our many visits to Bequia, I’ve rarely managed to time my arrival at the fish market to coincide with the arrival of fish.) I checked the freezer cases of every grocery store in town. No luck. I checked with Doris, who stocks all sorts of hard-to-find stuff in her fine-food store. Nada, but she sent me to the woman who owns The Porthole, known for its conch roti. She had lambi for her restaurant, but none to sell. “Where do you get your conch?” I asked. “Paget Farm,” she told me. Paget Farm is on the other side of the island, a bus ride away. Surely there was closer conch? I asked a couple more locals. Paget Farm, they all said. “Be there around 10 a.m., that’s when the boats will be in,” explained the woman in Lulley’s Tackle Shop. I had other stuff to do, but Steve (why did I already know this?) wouldn’t accept my suggestion of eggplant pizza instead. “I’ll go alone,” he volunteered. Fat chance. Let him have the adventure while I swabbed the decks? We both went. 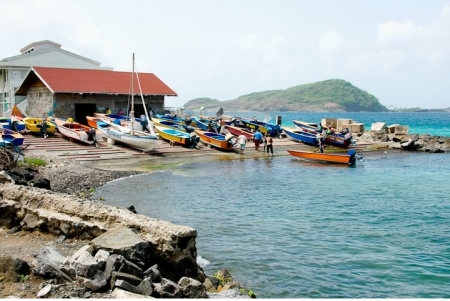 The Paget Farm fishing harbor was quiet when we arrived the next morning, but there were some guys liming. 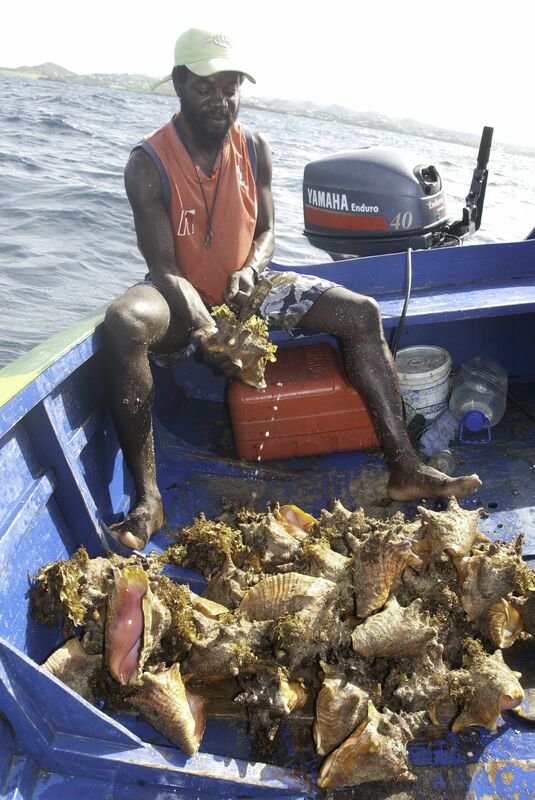 “Can we buy some fresh conch?” I asked. Unfortunately, no: Tourist season was over, so the fishermen weren’t going out regularly. But they had plenty frozen…in 5-pound bags. Only about 3 pounds more than I needed. Uncleaned. Oh. One of the guys offered to run home and fetch a bag. “He’ll clean it for you,” he said, pointing to another guy. An hour later, we were on our way, with not just the conch, but also a new way of tenderizing them, thanks to the guy who did the cleaning. Instead of pounding them, he demonstrated a kind of butterflying technique – slicing them open horizontally (keeping the two halves attached), then making a couple long diagonal slices in each half (creating a series of flaps), and finally cross-hatching them. He assured us the conch would be wonderfully tender. Back onboard, since I couldn’t refreeze the 3 or so pounds of raw conch I didn’t need for that night’s pizzas, I pressure-cooked and vacuum-bagged them before cramming them into the freezer. This was the conch that made it to Hog Island. My mistake was telling Dwight and Stevie that it wasn’t Grenadian lambi before they tasted the pizza. Frankly, I thought the pizza was mighty fine. I still had a couple more Bequia lambi in the freezer. “We need a blind taste test,” said Steve. As it turned out, what we didn’t have was time: We left for Trinidad a couple days later. Next season. But let me report that every last slice of the “inferior” lambi pizzas disappeared that evening. 1. For a couple of pizzas, you’ll need a couple of good-sized lambi. Tenderize them and cut into small cubes. Cook in water with a little salt and pepper until tender. I do mine for about 15 minutes in the pressure cooker. Drain, reserving a bit of the cooking water, and set aside. 2. Make a basic tomato sauce: I usually sauté some seasonings in olive oil – chopped garlic, onion, seasoning peppers, sive, a bit of hot pepper – and then crush a large can of plum tomatoes into the pot. Add the reserved lambi cooking water and season with salt, pepper, and fresh thyme, oregano, or basil if you have it (otherwise, dried thyme or oregano). Bring to a boil, then reduce heat and simmer, uncovered, about 20 minutes, stirring occasionally. 3. Add the lambi and continue to cook until the sauce is thick. Taste and adjust seasonings. 5. Cover the dough with sauce – a thin layer of sauce but lots of lambi pieces. Top with grated mozzarella. Bake in a preheated 400˚ oven for 15–20 minutes, until crust is crisp and cheese is melted. Tip: The sauce is also great on pasta. 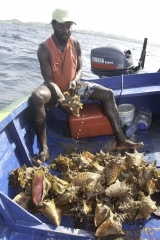 A Bequian informed us of the best way to tenderize conch. We had been trying to hammer it into submission on a concrete floor, but the conch meat always shot across the room and hid under a chair. Our friend told us to pressure-cook the meat in lime juice. It does come out sweet as well as tender doing it this way. Thanks for the great blog post, Ann! I’ll be back in Bequia in a couple of weeks. Awesome reading about your experiences Ann – love the blog, fotos great too.